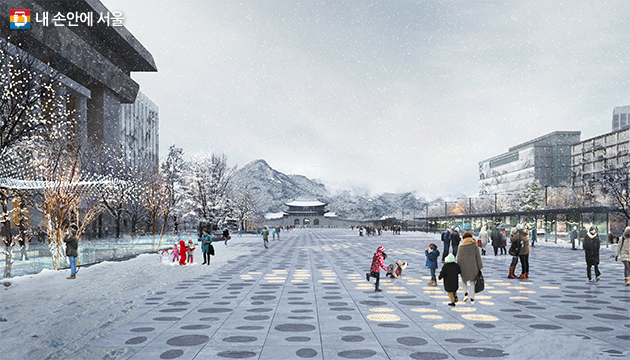 Seoul recently* unveiled the winning concept for Gwanghwamun Square renovation, and 'Deep Surface' confirmed the hopes and worries we shared in April last year (see "Gwanghwamun Square Enters Third Dimension"). As expected, things are also getting political. The good news is that the debate will continue more publicly until the end of this year. Work is still supposed to start next year, and the goods to be delivered in 2021, ahead of the 2022 presidential elections. Of course, SEUNG Hyo-sang and YOO Hong-jun remain key jurors when it comes to selecting a project suitable for both the Mayor and the President: the former City Architect is now heading the Presidential Commission on Architecture Policy, and the former Cultural Heritage Administration boss had earlier been mandated by MOON Jae-in to study the feasibility of his campaign pledge, eventually abandoned, to move the presidency out of Cheong Wa Dae. SEUNG, who oversaw Seoul's shift from redevelopment to urban regeneration, must have enjoyed the focus on pedestrians and citizens, the historical continuum, and the respect of recent heritage. 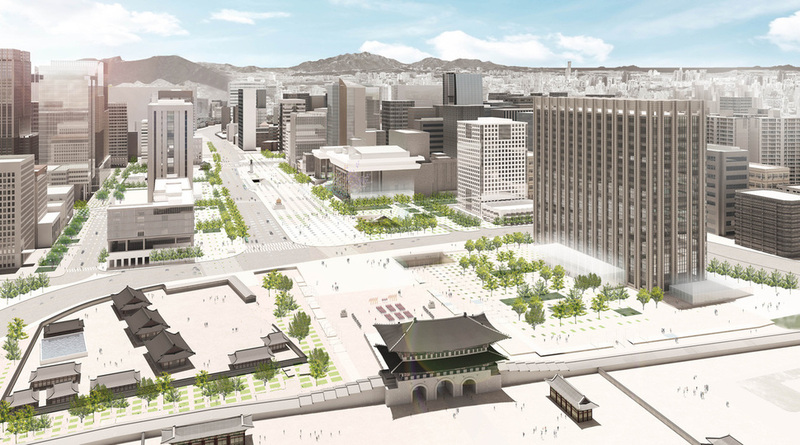 YOO can also be happy: if the Ministry of Culture and Tourism foots one third of the bill (Seoul Metropolitan Government the rest), the Historic Square covers 36,000 sqm compared to 24,000 for Citizen Square. 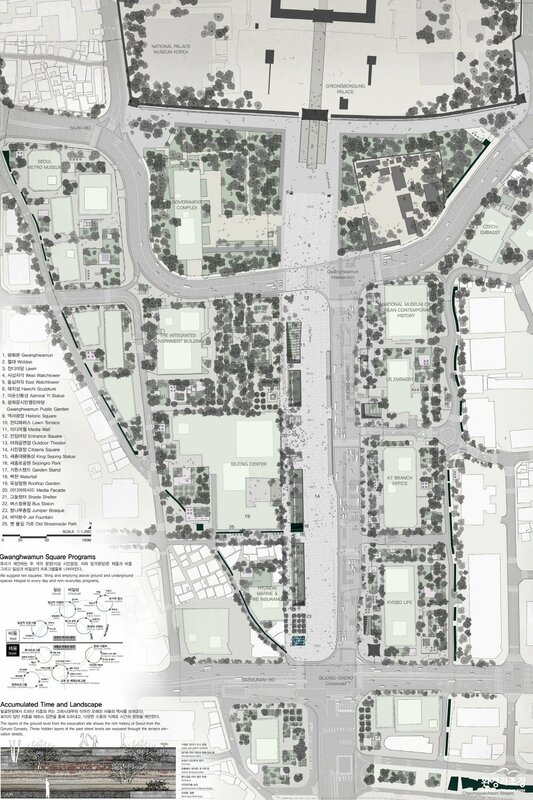 From the start, this project's key challenges were only 10% about architecture and 90% about urbanism. 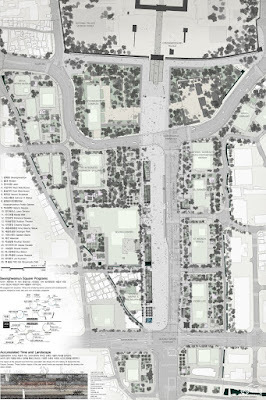 As I explained before, more than the vertical alterations along Sejong-daero (extension of the square, reduction from 10 to 6 lanes), the main revolution is horizontal, what I called 'The Royal T' being transformed into a crooked Y as Sajik-ro plunges towards the South, suppressing the Western end of Sajik-ro 8-gil, and the tunnel that came with it. Sajik-ro now marks the frontier between two Gwanghwamun Squares: Historic Square (North), and Citizens Square (South). Again, it's not just the gate that's brought closer to the center, but also the traffic. Again, merging Sajik-ro with Sajik-ro 8-gil means merging transit circuits with neighborhood circuits, and creating new unnecessary bottlenecks. And yet again, what about the bus and bicycle lanes? I'm afraid I have to stick to what I wrote last April: "Unfortunately, like with Seoullo, impact surveys have obviously been eluded in a race to meet electoral deadlines, and authorities chose to worsen traffic situations by not tackling them". Before heralding the future Gwanghwamun Square as the equivalent to the Arc de Triomphe in Paris, Mayor PARK Won-soon should have learned that for all Parisians, Place de l'Etoile is a symbol for extreme and messy traffic. I'm not the only one to wonder if every impact is truly taken into account: as soon as the new blueprint was revealed, the authorities in charge of policing and traffic said that they had yet to agree with what's proposed, and a key administration wished it had been consulted for the road cutting through its premises. If Seoul City is very unlikely to drop the piece de resistance from its master plan, it is also very unlikely that a satisfying solution can be found to the problems it generates. Before the end of this year? Impossible. I wish it could be compensated with public transportation, but even if the GTX A (Unjeong Paju to Dongtan) and Shinbundang Line eventually join Subway Lines 1, 2, 5 in the ambitious transportation hub envisioned, new bottlenecks will severely limit its multimodal potential. I guess I made my point on this crucial issue, so we can move on. Now shall we further look into 'Deep Surface'? 2 squares instead of 1: that makes storytelling much more simple. 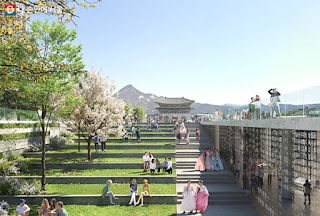 Picture on one side the changing of the guards on Woldae (the ritual stage to be rebuilt in front of the gate), next to the hanok cluster already under reconstruction (next to the Museum of Contemporary History), and on the other side a k-pop concert at the feet of Sejong Cultural Center. Also, it's easier to contain a demonstration on the aptly named Citizens Square, while tourists claim their safer haven by the palace and its museums (not to mention pictures of the landmarks not photobombed by PARK Geun-hye supporters). Of course, there's still that humongous Government Complex ruining Historic Square's narrative and perspective, but you can always say it's a tribute to Sejongno's Yukjo tradition**. 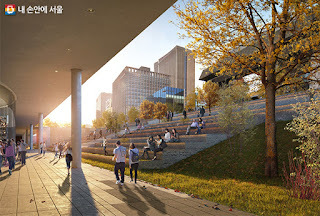 Underground extensions and interconnections: Overall, you can seamlessly walk for four kilometers from Gwanghwamun to City Hall to Euljiro to Dongdaemun. Yes, the biggest section remains the one mentioned in our recent focus ("Euljiro v. Wide? My Alleyway or the Highway"), and I presume it's connected to the soon to be inaugurated space in front of the Anglican Cathedral (see "Sejong-daero winner announced"). 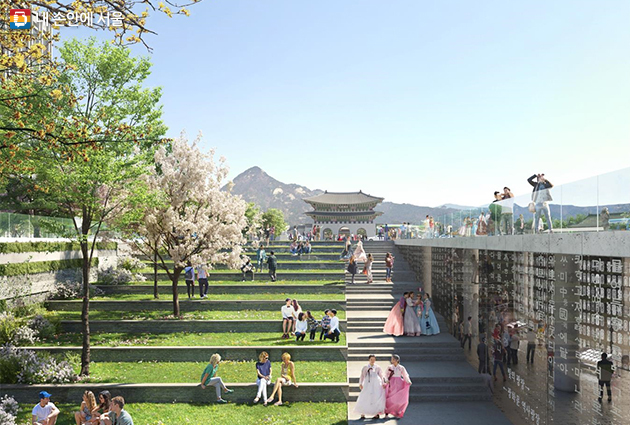 I'll still prefer walking outdoors between Seochon, Bukchon, Sajik-dong, Jeong-dong, Cheonggyecheon, Gyeonguigung et al, except under extreme weather... or under extremely bad air quality, provided the program includes air purification systems. In Jeokseon-dong, Jeokseon Hyundai Building seems to be turned into a 'Seoul Metro Museum'. I wonder what the tenants (e.g. Bloomberg, Korea's youth hostels association) think of it. There's a lot of fuss about the potential moving of King Sejong and Yi Sun-shin statues (closer to Sejong Cultural Center), but I'm not a fan of these erections, and to me that's nothing compared to the road mess I mentioned earlier. Note that Haetae statues move back, closer to where they were in Joseon times, but nobody seems to care. 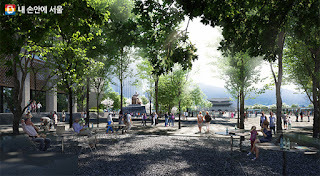 Sejongno Park might at last find some purpose and relevance. I wonder why Terrace Lawn, the new slope connecting above with underground, doesn't have an actual slope, accessible for wheelchairs or baby strollers. I hope they'll fix this ASAP. 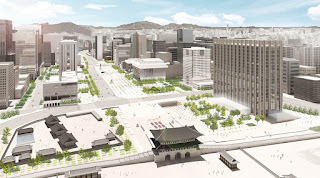 I'm curious to see how Seoulites will roam the space, rediscover Sejongno's Western sides, how 'Gwanghwamun Samgeori' will join 'Sejongno Sageori' in our vocabulary, how History will keep unfolding on Gwanghwamun Square 3.0. 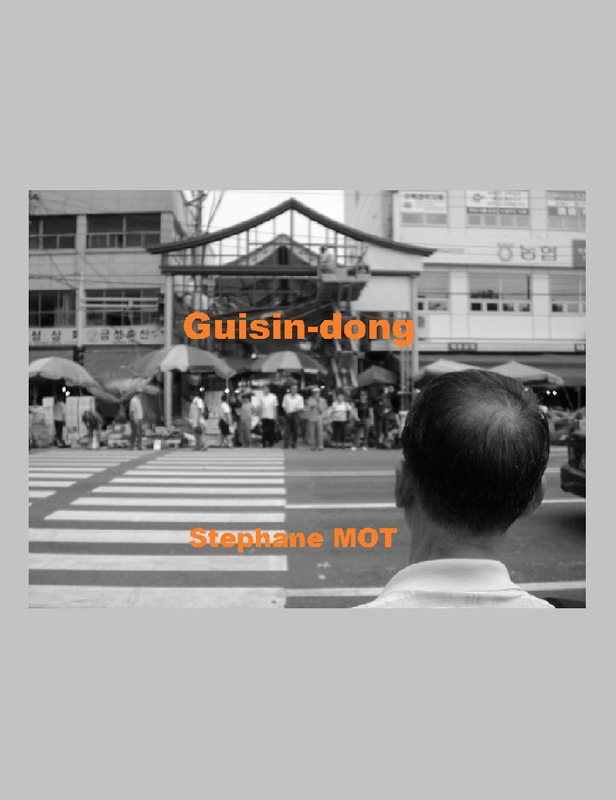 Whatever happens, this will remain Seoul's political and cultural epicenter, and its most defining perspective (Sejongno-Gwanghwamun-Gyeongbokgung-(Cheong Wa Dae)-Bugaksan-Bukhansan). ** the notorious six ministries. Note that the project still includes a Yukjo Street tribute and its restaurant tradition. Reminds me of that old joke with a mobster telling his staff he went to Sejong Cultural Center last night, only to be asked in return 'which restaurant?' by thugs for whom the name only refers to a foodies neighborhood.